2. 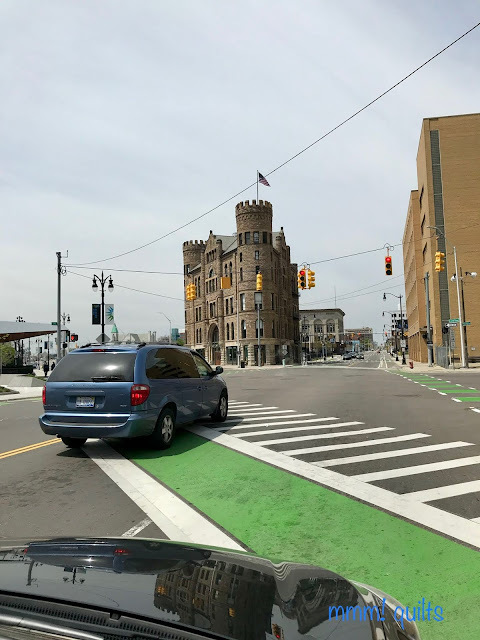 I like interesting buildings, and Detroit has many of them. I especially like corner ones like the one below. 3. I just love time with my grandson, Brady. We had him all to ourselves for the May 11-13 weekend. 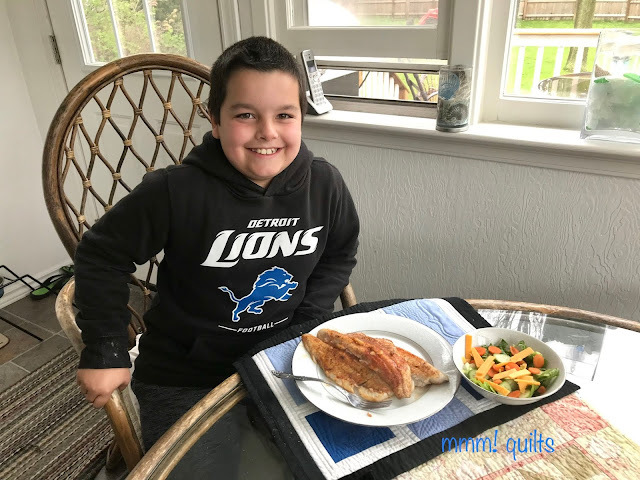 And then, even though the circumstances were not at all good in which I got to spend some unforeseen extra time with him, it did give some much-needed respite to a time of such heartbreak, sorrow and angst. 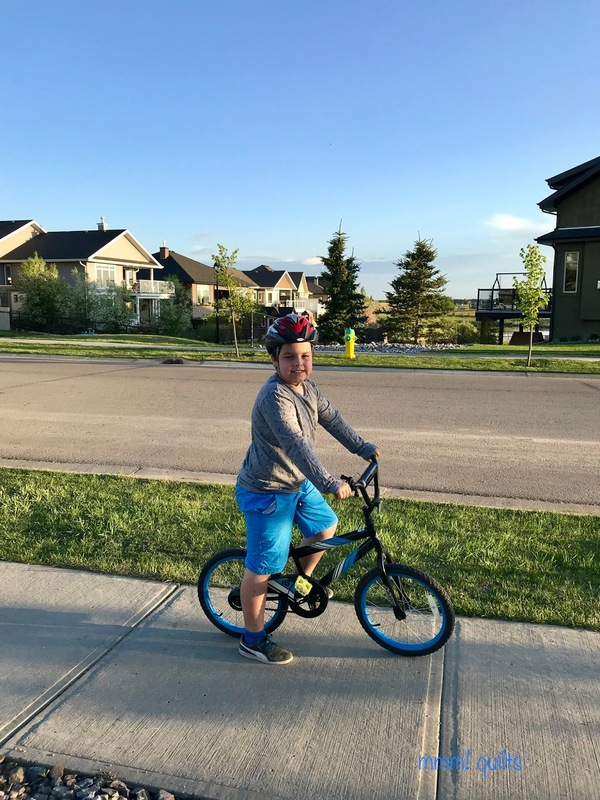 Biking (me walking) on a very long ride/walk in Beaumont, Alberta. 4. I like this sign I spied on someone's lawn. Dayna and I were out for a walk in my mum's neighbourhood on another one of the gorgeous days we had while there. It reminds me today that I have to finish the binding on the first of my two H2H quilts and drop it off for refugees. 5. I have a new like: Blizzards. Can you believe I've never had one? I know it won't be my last! I've had ice cream cake, and the hot fudge brownie delight is my favourite, but this? Salted caramel I believe, yum. Brianne took me there after a soccer game of Brady's. I like watching my grandson play, and I was able to catch two games and two practices while out there. 6. I love music; CBC Radio 2 plays from 9am - 5:30 pm and is only pre-empted by WRCJ the Detroit classical/jazz station, or my iPhone docked into my stereo. Even when no music is on, I usually have some piece running through my head, and the pieces run the gamut from classical, to blues, to rock, both classic and new, to many vocal styles, light jazz, light opera, New Age, World, folk....there isn't too much music I dislike. Being back in Mum's house for much of our stay there in mid-May meant her radio had to be on, and I didn't have to change it; CBC was the station when I pressed the on button. She also loved Ici Musique, the French CBC, or Radio Canada, station, and like me, CKUA (which streams live online; I encourage you to take a wee listen). I often talk of music in my gratitude posts, and not having her around to tell about a piece I heard, and for her to listen for it, or for her to tell me of one she'd heard is another profound loss. CBC has the same programming which airs at the same time in each of our time zones, so being two hours ahead of Mum I could text her to say, 'Be sure to listen at 10:20 your time for this Rodgrigo piece, or Rolf Lisveland'... It's another hole I don't know how to fill. 7. Many of you may recall my mum's favourite colour was green, and that above all, she loved flowers. Her 80th birthday quilt I named 'Forever Flowers', and it now sits on the love seat in our living room. All too soon for it to come back to me... 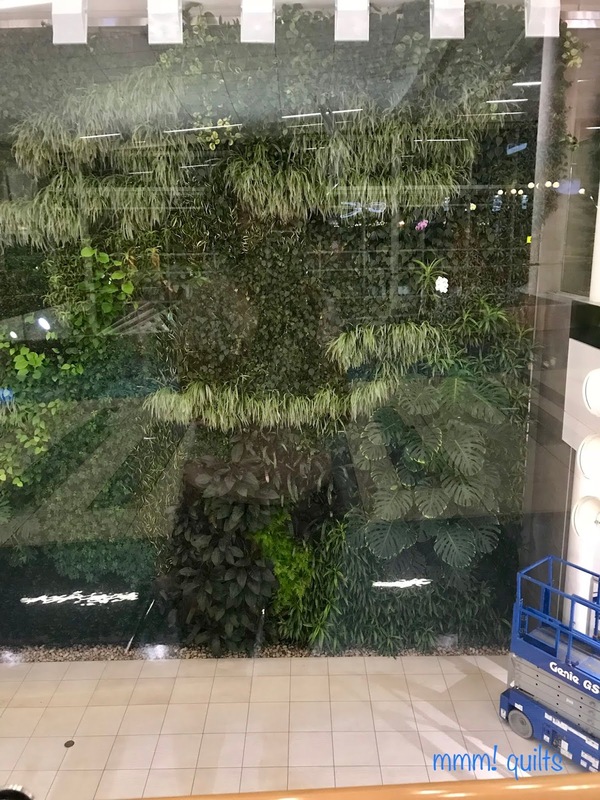 This Living Wall of green that my daughter Brianne told me is her favourite thing in the new part of the Edmonton International Airport captivated me. 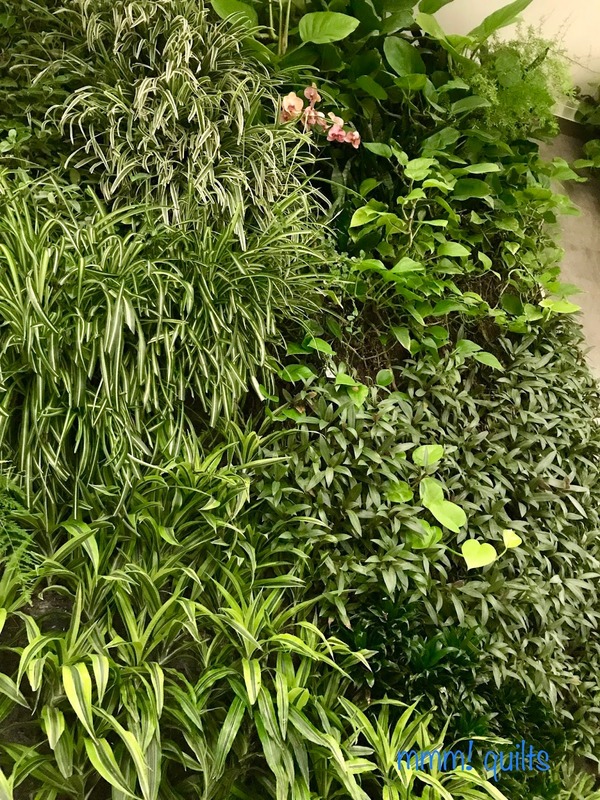 I can't explain the feelings and sensations I got as I gazed at, and then sat by this over 2-storey high wall, but I'll try: serenity, peace, the smell of the colour green (anyone from the north who lands in a southern Florida airport in November-March knows that green has a definite smell), healing, purity, the cycle of life, clean, balm, awe, peace... just scratch the surface. A shot from the upper level pedway to try to give a sense of the size of it. Think of a two-storey mall with an open space and you'll start to comprehend its size. That's an extendable ladder thingie in the lower right. We need, no the world, needs more green. 8. I like auto racing. I spent three evenings of our honeymoon at a racetrack, no lie. Stock cars. My husband has been a racing aficionado his entire life. 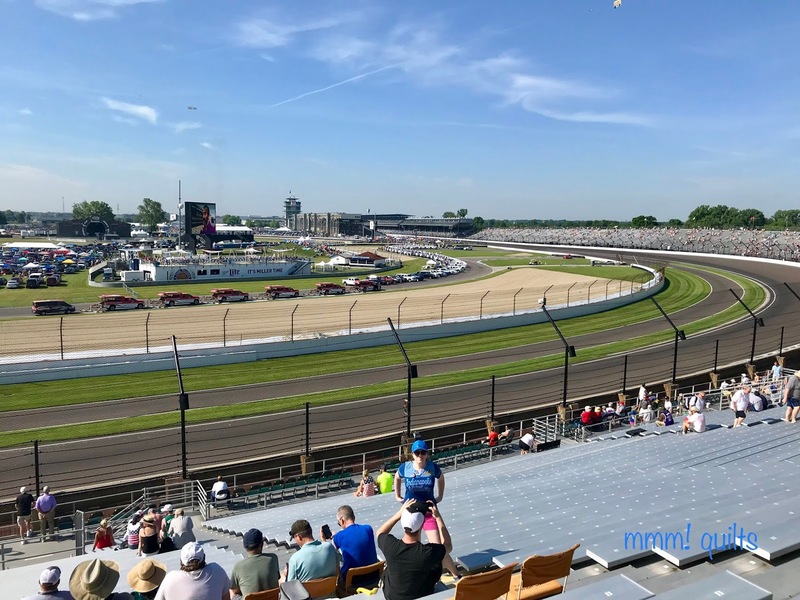 We went to the Formula 1 race at this very track, Indianapolis, the quintessential racetrack, eleven years ago. Little did we know then that it would be the last F-1 race in the US for many years, and the last one at this track. 9. 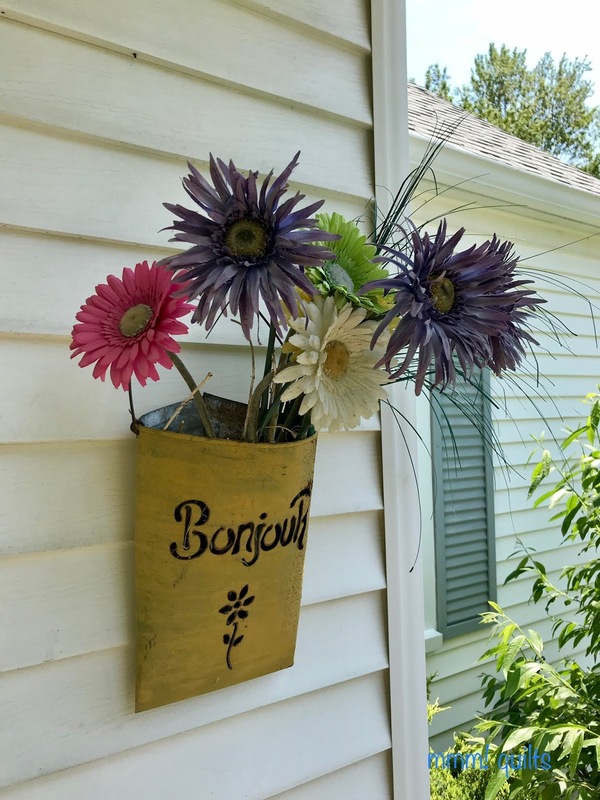 I like this outdoor 'Bonjour' metal bag which I always hang by my front door. I bought it in Montreal on one of the Quebec trips I used to take my students on. It's about 10 years old now. 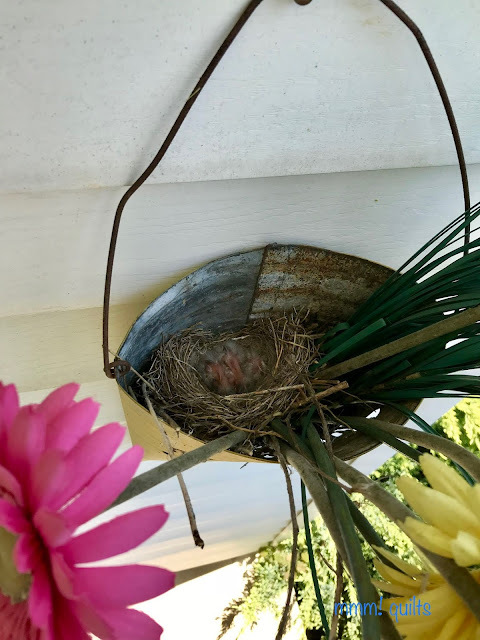 I'd noticed for a while each time I opened our front door a robin would fly from somewhere on/near the porch, and so I knew there had to be a nest, but assumed it to be in the eavestrough. Nope. I think there are four new hatchlings in there. 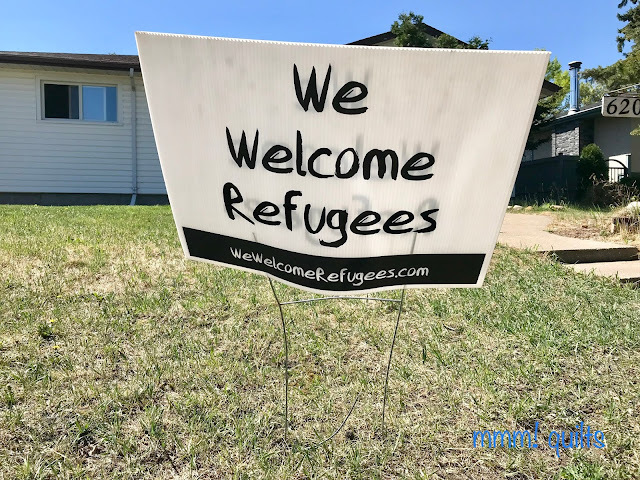 They are welcome to begin their life there. So I guess I like babies. Who doesn't, right. He hung around the front flowerbeds for over an hour. I know his parents were nearby, keeping watch, bringing him food, enticing and encouraging him to spread his wings. A good metaphor upon which to end this post. with LeeAnna at Not Afraid of Color where you will find several of us who write these posts. Feel free to write one and join us. Personally, I like/love your like/love posts. So many things to like in your post, Sandra! I really enjoy your writing, and I hope writing about gratitude is another step on the road of healing from your mom's passing. 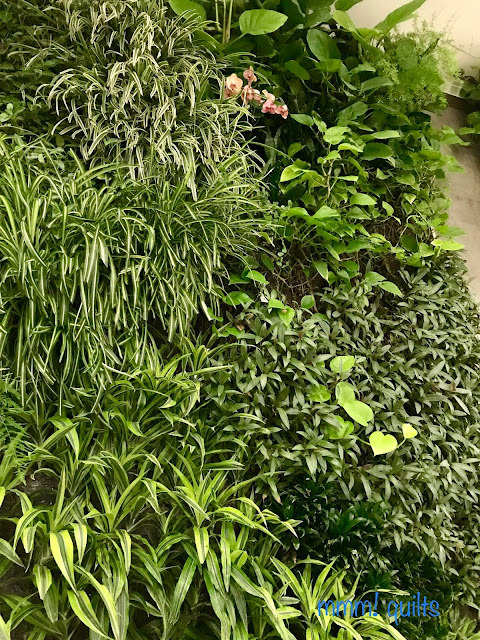 That wall of green - wow! What a neat thing in an airport! Glad you've had some extra time with your grandson. We are going to our first Indycar race, next week, in Dallas! A brand new experience for me, and now I'll look forward to it! Hugs and love to you Sandra. Those baby birds on your porch are adorable. I liked them all but your grandson's open happy smile might have been the best. He picked out fish to eat?? Sharing a song with your mum... I felt your loss with that simple gesture, and bet you have those moments with your daughter too. Fantastic post! As a side note, my husband has restored a '65 Mustang and while we were in Las Vegas for the Mustang 50th Anniversary, we got to race it around the Las Vegas Motor Speedway (where they run Nascar). What a RUSH! In an old car. On older tires. With new Mustangs passing us. Whew!!! All those flowers are so beautiful! 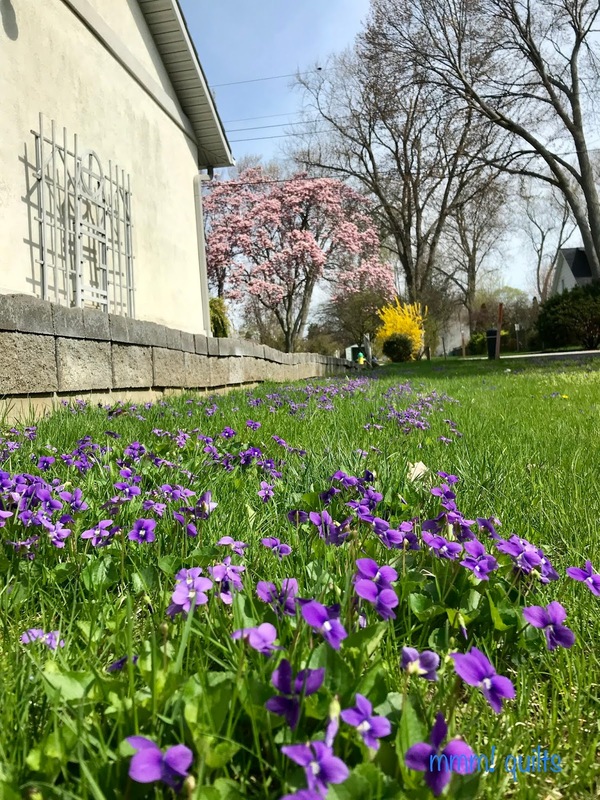 It's switched straight to hot summer here, but I love love the flowers I'm seeing everywhere. It's worth a little heat. I'm glad you discovered blizzards! They were always a super-special treat for us when traveling. We didn't eat out as kids, and there was no dairy queen in our town, but my mom loved blizzards, so if we happened to go through a town with one, she would sometimes let us get one. I remember many hot dusty travels through west Texas/NM made super creamy by a heath bar blizzard! Love your post Sandra. The living wall at the Edmonton airport is indeed something to see. Will be taking it in, in a couple of months. Take care and hugs. I loved your post. Thanks for sharing all of this. Wonderful I LIKE post....thanks for sharing it! What a sweet post. Family, spring flowers, lovely music, memories of your mum, time with your grand son. Life is good. Extra time with Brady, the birthday, and memories all intertwined, your Mum would want her quilt to be shown with love, not hidden away, and as you see it every day, know her love will always be there.Green, a refreshing colour, no matter what shade or hue, and down here, green grass topped with white frost is beautiful. Great post. I am so very sorry for your loss. Yep I know that huge hole when you want to share with someone and they are no longer there. How fun that you got to spend time with Brady, and the birthday trip to the track! How awesome is that. What a lovely, thoughtful post, Sandra. Hugs to you. Great list. But you're never had a Blizzard????? They're amazing, right!!! So evocative. Happiness and sadness side by side. This is so wonderful Sandra. I didn't know about this link up and I think I will join next month. Even in sadness you have so much to be grateful for. I am new to your blog (came over from LeeAnna's I Like Thursdays) and I enjoyed this post very much. 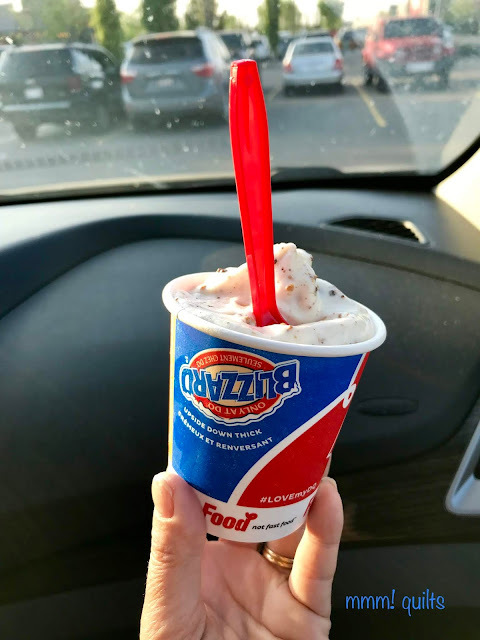 Welcome to the Blizzard fan club - I like how they come in the mini size so that I can enjoy it without feeling too guilty! 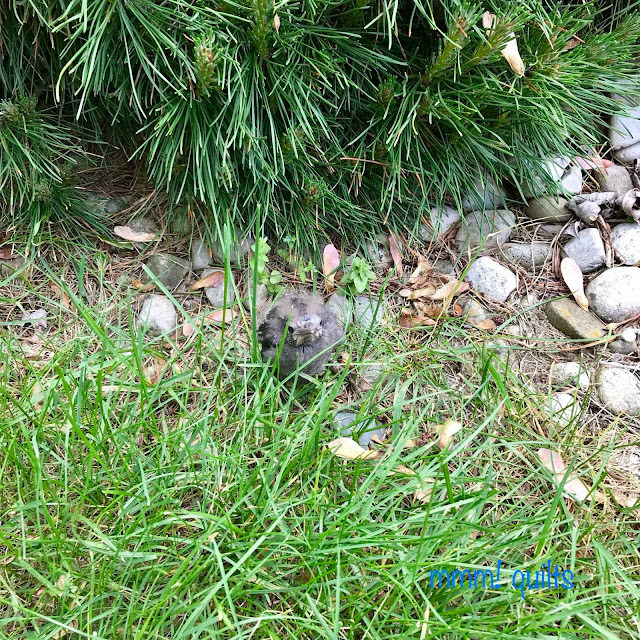 Love the nest and the little ones … nature always finds a way! 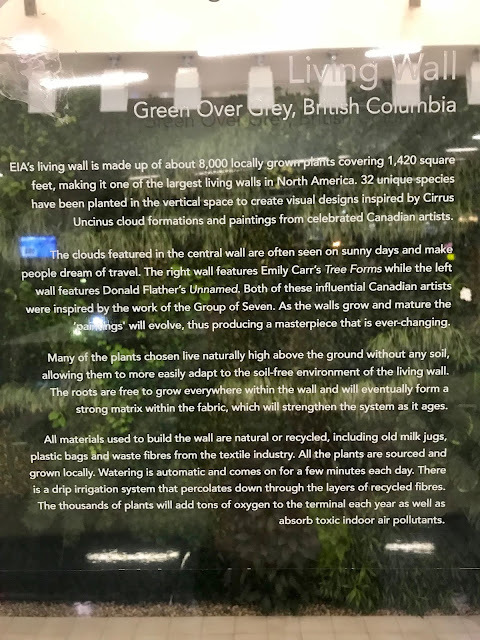 And the Living Wall at the airport is jaw-dropping. I couldn't really gauge the size of it until you pointed out the left thingy. Wow!